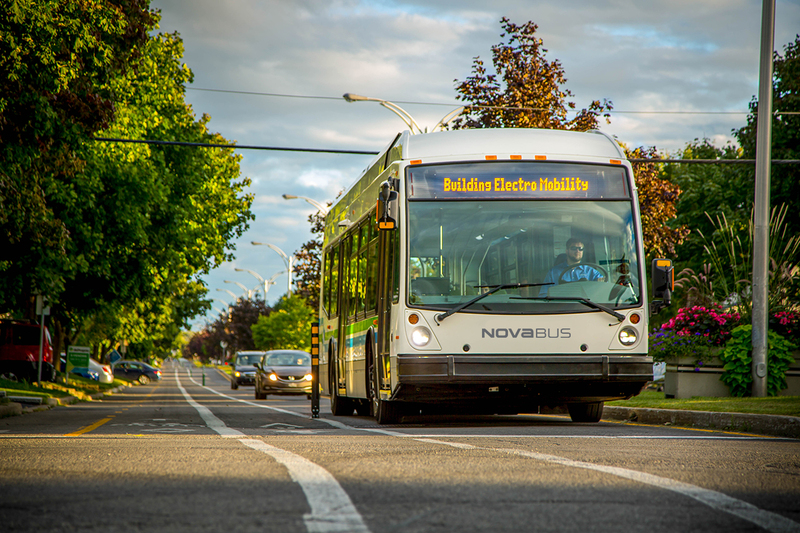 SAINT-EUSTACHE, QC, October 17th, 2018 – Nova Bus, leader of the Canadian bus market and one of the largest providers of sustainable transit solutions in North America , is proud to announce a new contract with the South Coast British Columbia Transportation Authority (‘’TransLink’’) for two 40-feet electric LFSe. This new agreement with the Metro Vancouver’s transportation network highlights its desire to significantly lower emissions of carbon and other pollutants in the coming years, positioning itself as a leader in this domain. Last spring, TransLink had announced a special project supported by the Canadian Urban Transit Research & Innovation Consortium (CUTRIC) with the intention to integrate electric buses and charging infrastructure from competitive manufacturers in public transit network in several Canadian cities. This new deal falls under the first phase of a Canada-wide Electric Bus Demonstration and Integration Trial. This ambitious project brings together manufacturers, transit agencies, research teams, funding partners and technological tools and players in the manufacturing industry. “TransLink and Nova Bus are already business partners and we are delighted to have come to this new agreement which is reflecting Vancouver’s and other Canadian municipalities’ commitment to sustainable mobility by using electric buses, said Martin Larose, Vice President and General Manager of Nova Bus. CUTRIC’s leadership has to be underlined as the organization has brought together manufacturers and other stakeholders to make charging stations cross-compatible and, by the same token, encourages cities to consider the electric shift for their transit”, added Mr. Larose. Nova Bus will be delivering in the first trimester of 2019 two electric buses, energized with the overhead electric charging stations compatible with the OppCharge protocol and supplied by both Siemens and AAB. Adding to that, the company confirmed that this order will be entirely assembled in Canada. “Nova Bus’s advanced electric bus technology is a great jobs story for Canada. It’s showing the world that Canada can lead in the electric vehicle technology domain, and it’s attracting global attention to the highly qualified skills this country’s manufacturing sector has to offer”, said Josipa G. Petrunic, Executive Director and CEO of CUTRIC. For the past 18 months, Société de transport de Montréal STM (Montreal Transit Authority) has been operating its first electric buses in Montreal, with OppCharge On-route charging technology – a first in North America. The 3 LFSe vehicles delivered by Nova Bus, cumulated more than 100,000 kilometres and performed more than 11,000 fast charges. STM has recently renewed trust in Nova Bus by ordering 4 additional electric buses, scheduled to be delivered end of 2019. For further information, contact Salim Idrissi at 438-349-5486 or salim.idrissi@consultant.volvo.com.